The land called Buckland Farmstead…….Note 1: The land area of Brighton has been reduced by annexation, from the maximum (1817), when it contained all the land east of the Genesee River and west of the Towns of Pittsford & Penfield. It was bounded on the south by the Town of Henrietta & on the north by Lake Ontario and contained about 45 square miles or approximately 29,000 acres. Today @ 10,010 acres the Town has been reduced by approximately sixty percent. Title to land and history were lost. One example of loss was the annexation of Brighton Village in 1905, a loss of 750 acres. The City renamed the Village as the 21st Ward leaving the Town smaller in land, history and without a Village center. We plan to keep the Village history alive and remembered. Historic Brighton is in the process of collecting detailed information that will supply the contents for an Historical Map. The first phase is to define notable land areas that could be identified. 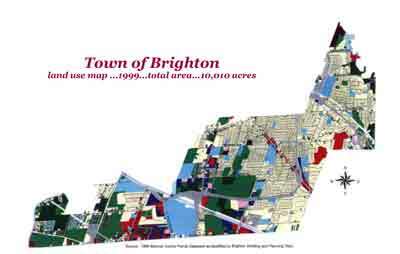 The land area of the original Town of Brighton has been greatly modified by the annexation procedures of our neighbor city, Rochester. To properly reflect the history of the 1800’s will necessitate defining an area larger than the present Town boundary. No other town in the county of Monroe tolerated such a massive change as Brighton experienced. As such the problem is somewhat complicated, but we will continue to collect and someday soon produce an acceptable map for your viewing. The old farmhouse, with its two front doors, embodies features of just about every architectural style from popular from1830 to 1950. Based on structural evidence, the earliest part of the house was built c.1830s. It has log beams in the basement and a lot of spiders! The house was a story and a half one-room brick building at first, but shortly after, an addition of similar size was added to the west side. The larger brick Greek Revival west wing came next, c.1840. The frame construction east wing was added in the late nineteenth century and the second story around 1915. The latter is easy to see because gray cement brick was added to the red brick lower part for the second floor. Sometime in the mid-twentieth century the gabled roof was replaced with the hipped roof we see today. It had been suggested that the house may have originally had a gable roof design that was changed to the hipped roof during a later nineteenth century expansion. The present house features simple vernacular details: symmetrically placed windows, narrow brick lintels and late nineteenth/early twentieth century front porch. The one and a half-story west wing retains a Greek Revival style with its wood cornice and gable end returns. It has been proposed that the main two and a half- story main structure may have also had a wide Greek Revival cornice before the roof was raised. Although the house first appears on the 1852 county map, it appears to be of much earlier construction. The basement’s random fieldstone foundation and joists of bark-covered logs, as well as the first-floor hearth/baking oven/fireplace with iron crane (swinging arm), indicate an early nineteenth century construction date – probably in the 1830s. The presence of the cast iron crane in the first floor fireplace is of particular significance. The crane appears to be original and it is rare to find a nineteenth century fireplace crane still intact on its original site. The only other known fireplace crane, at its original site, in Brighton is at the Stone-Tolan House Museum at 2370 East Avenue. To the right of the fireplace opening is a plastered-over wall. This appears to be the possible location of an early nineteenth century “bee-hive” baking oven. The Stone-Tolan House has a similar fireplace with an asymmetrical opening which leads us to believe that the Buckland Farmstead fireplace is located in what was once the family kitchen. The first floor presently includes a living room with the early fireplace, a dining room, two bedrooms, a kitchen and pantry, and an attached shed of the kitchen. A typically narrow nineteenth-century enclosed staircase leads to the second floor of the house where there is a large hall, four bedrooms and a bathroom. Three of the upper bedrooms have distinctive plaster ceilings and plaster crown molding. The hall features wide-plank wood flooring. The Buckland Farmstead is a house that best represents the growth of a town from the settlement period to the modern age. It began as a very small house and grew as the size and the needs of its families increased. It was never a Federal (as was the Buckland house at 1037 Winton Road South or Greek Revival (like the Buckland house at 1551 Winton Road South) – it was always a simple vernacular structure that reflected the lifestyle of its owners. In its later years, the house and the farmland surrounding it provided food and vocational experiences for the children at the Rochester Orphan Asylum, which later became the Hillside Children’s Center. It is also important historically because of its association with the Buckland family whose story was explored in Bricks of Brighton, Parts VI and VII. This house is one of three surviving brick residences in the town built and occupied by members of the Buckland family. The other two Buckland homes are at #1037 and #1551 Winton Road South. All three are designated Brighton landmarks. A fourth, no longer standing, was located across from the house at #1341 Westfall Road. It was occupied by Warren Buckland, son of Amos. It appeared on the 1854 and 1902 county plat maps, but nothing is known about the style or construction of this house. In 1911, the house and the 92-acre farm was purchased by the Rochester Orphan Asylum. It was 1915 when the second story of concrete brick was added to accommodate the residence of five orphans. Hillside Children’s Center sold the property to Roy McGregor in 1939 and in 1948, Max Gonsenhauser acquiredthe farm and raised beef cattle and dairy cows. In 1997, the Town of Brighton purchased the house and thirty-two acres of the farm now known as the Buckland Farmstead. The house has undergone a rehabilitation that had enhanced its historic features and bring about an adaptive re-use of the building. This project was funded by the Town of Brighton, Brighton Rotary and the State of New York. The Town’s official ribbon-cutting ceremony took place September 8, 2007.